We’re definitely in Francophone territory now, though we’ve found more people who speak a little German than English. The last few days have taken us through the Rhône valley, which while flat and hot is still surrounded by snow-capped peaks on three sides. 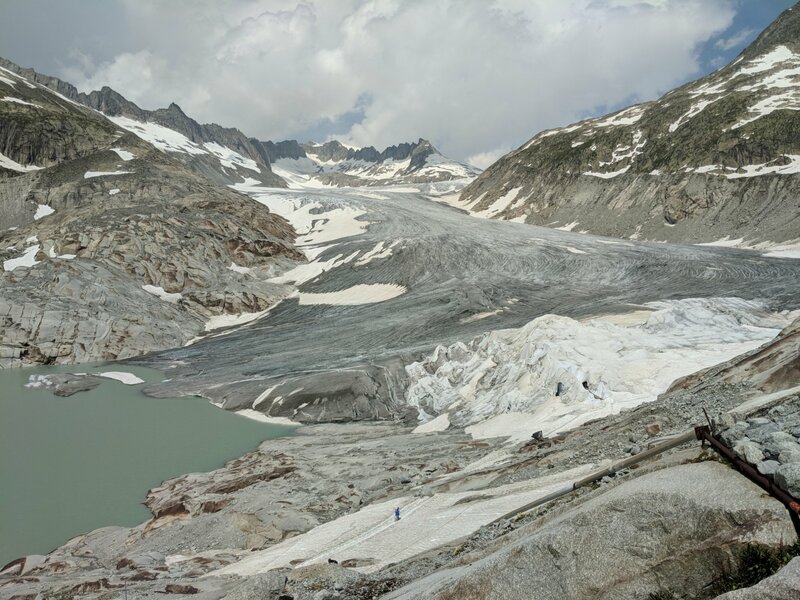 The Rhône river has grown up and is no longer the baby stream we saw at its source. 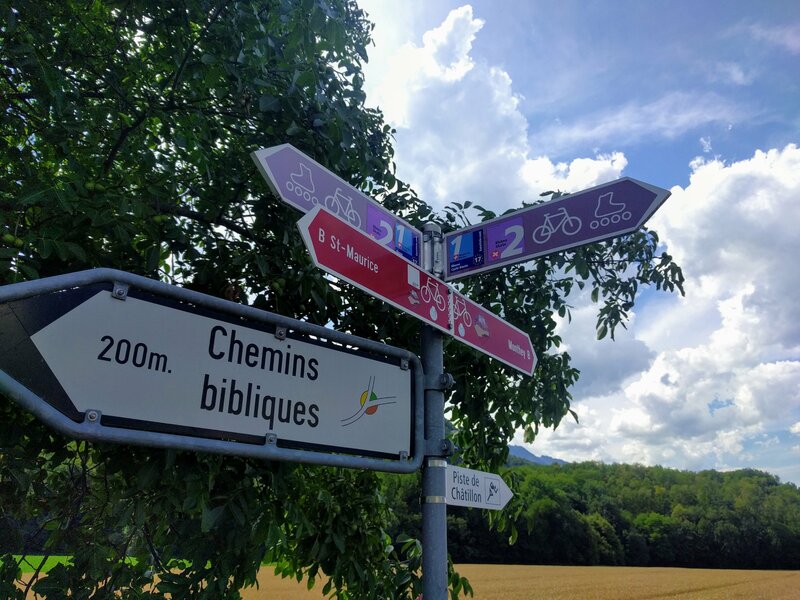 Interestingly, the bike route we are following also is an official inline skating route, of which we have seen several in Switzerland. I’m not sure if skating is actually that popular here (I’ve only noticed one person with skates on the path) or if these signs were just all put up in the early 90s. Now the sad news. 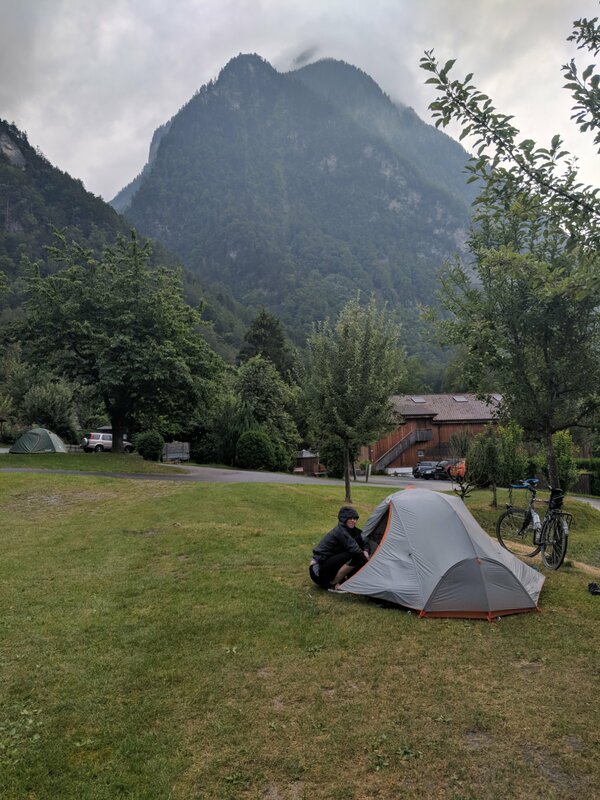 At the end of the day – after already having had to fix two flats – Greg heard a loud ‘chunk’ and discovered that his frame had actually cracked in two at the chainstay. Nooo! Fortunately we were only a mile from the next town, so Greg walked it while I rode ahead to book us into a hotel. 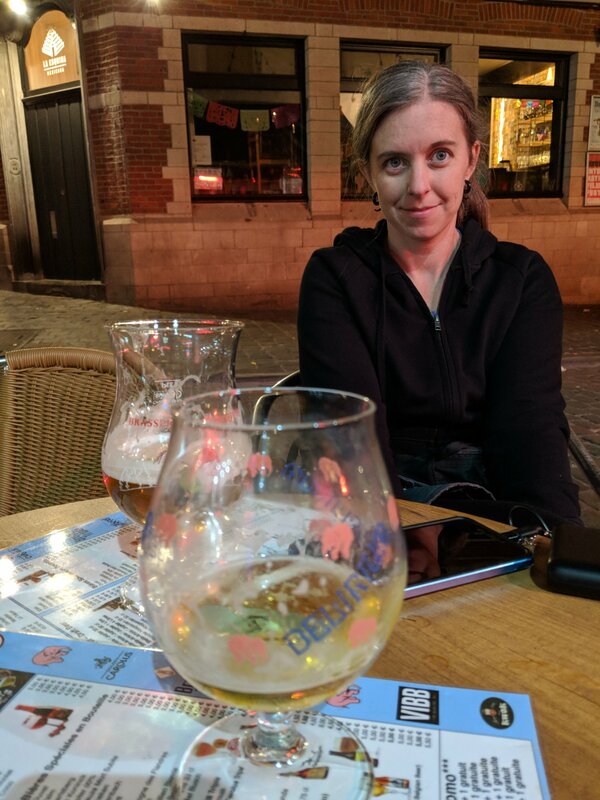 After some broken conversation in a mix of French, German, and English, some locals drinking at the hotel bar were able to help us find a welder to fix it. We were instructed to get up at 7 the next morning and find the guy drinking coffee in the lobby, because he always got his coffee there before going to work, and ask him for help. We did, and after he’d inspected the break he skeptically asked if it was aluminium. Greg told him it was steel, and immediately he said something like ‘oh, well no problem then,’ and threw the bike in his van and took off. A few hours later he returned the bike with the crack welded back together, strong and ready to roll! 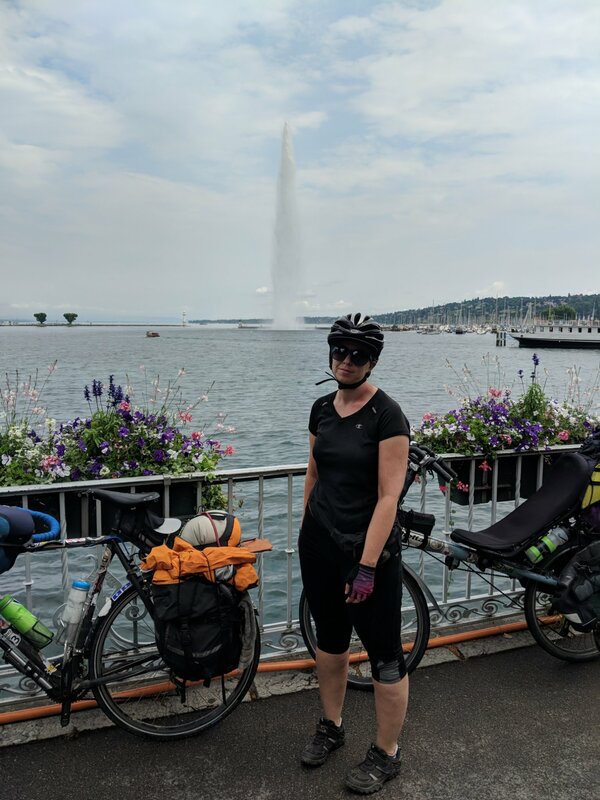 We cruised down to Lake Geneva, where we got rained on a bit. 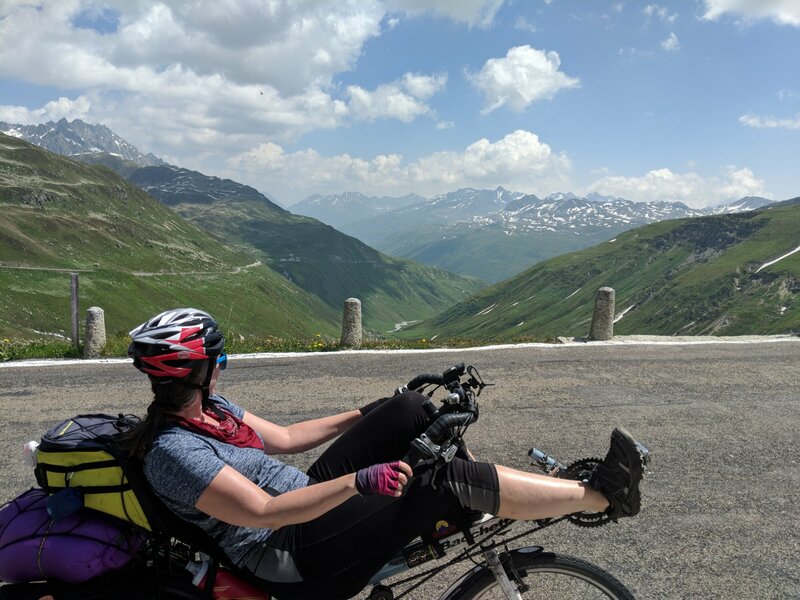 Riding around the south shore of the lake took us back into France, and we ended up staying the night at a super deluxe French campground that was like half the price of anything we’d found in Switzerland. 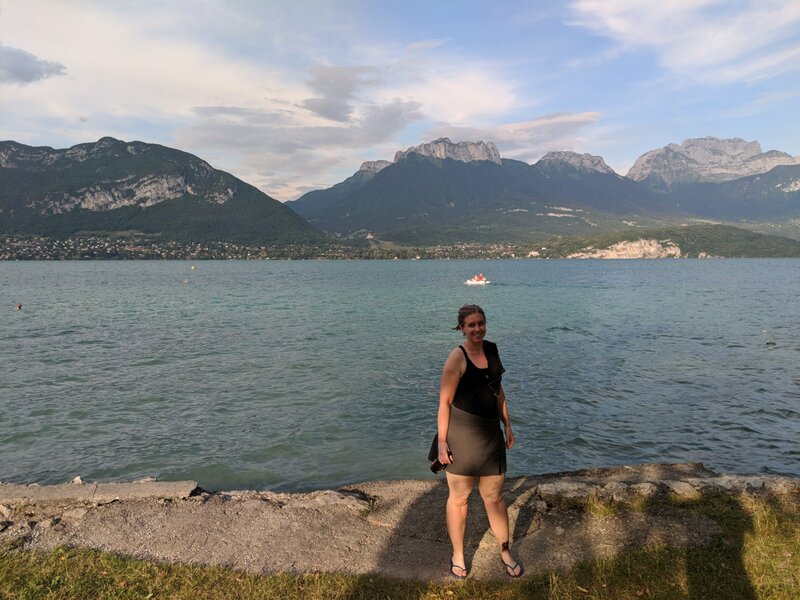 After popping back into Switzerland in Geneva, we headed south on some unpleasantly busy roads, but then we got to Annecy, a cute little city on a beautiful lake. We got there just as France won a World Cup game against Uruguay, and the streets were full of people waving flags, honking horns, and setting off fireworks. We then found a great lakeside campground and took a dunk in the water – so much nicer than any other lake we’ve seen on this trip! Wow. 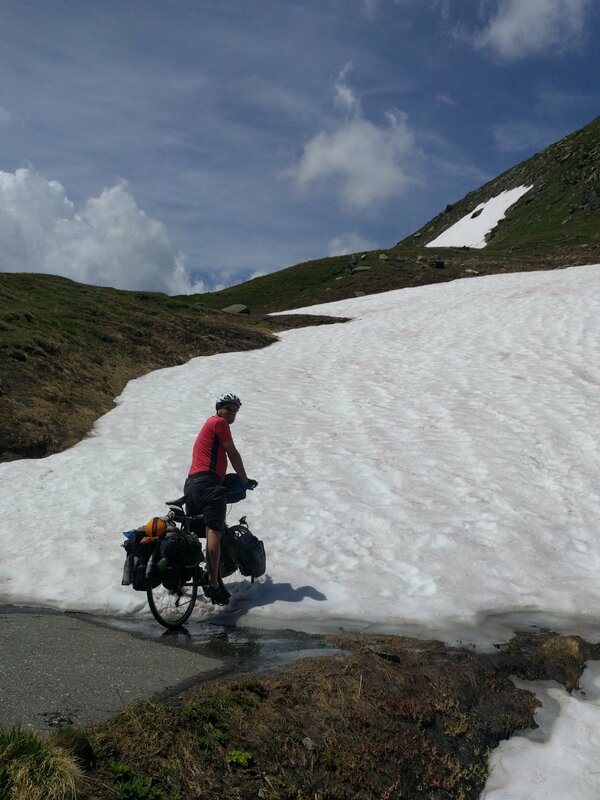 Riding though the Alps has been spectacular! 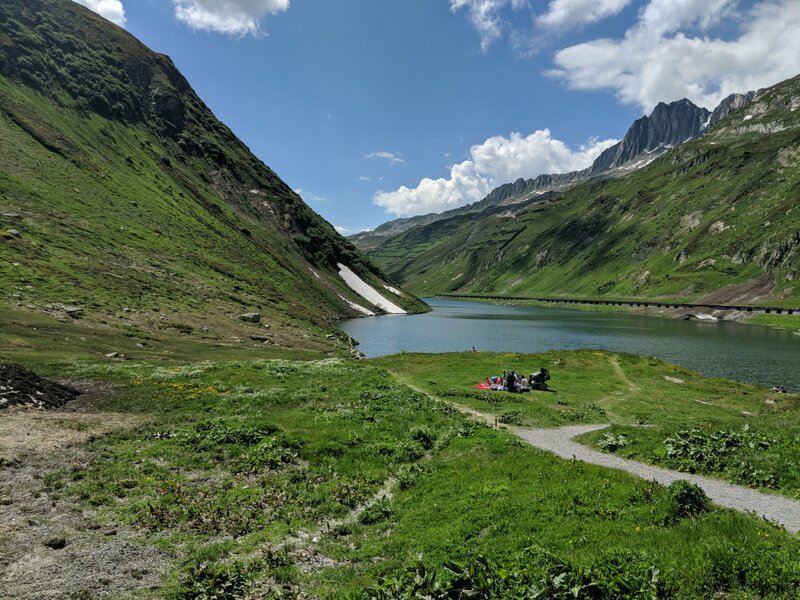 I had a long, tough day on Saturday, climbing about 4800 feet over 36 miles to get to the top of Oberalp pass, and the source of the Rhine – but it was absolutely worth it! 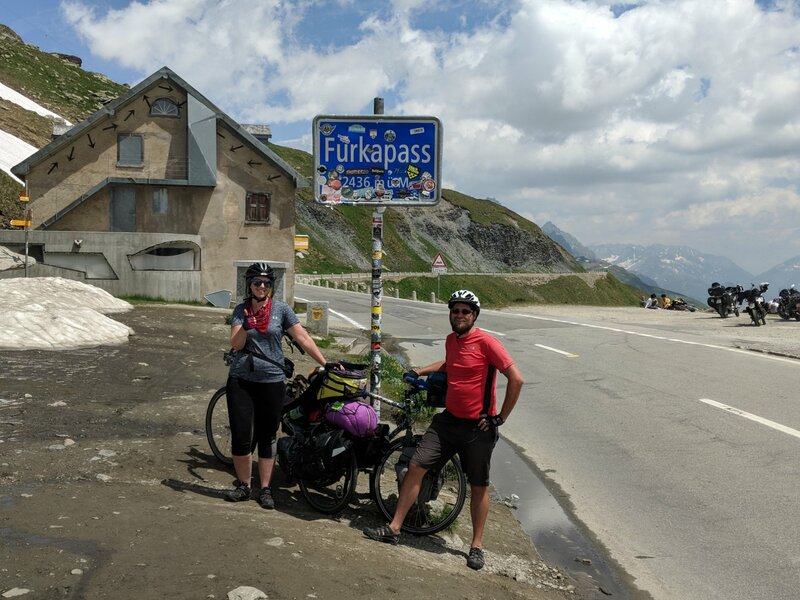 Erin and I rode together as far as Disentis, where she smartly took the train to the top of the pass, leaving me to do the last 3000 feet / 13 miles on my own. 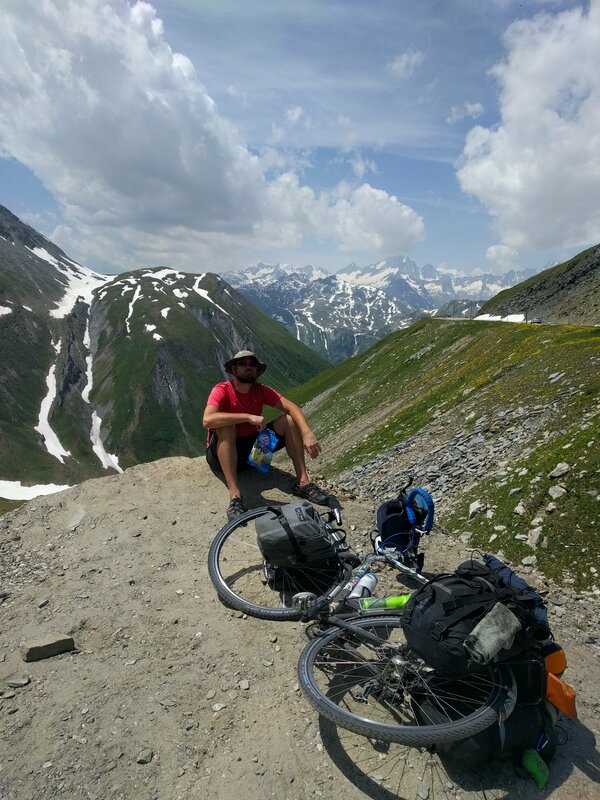 It was a beautiful, amazing ride, full of jaw-dropping views and tight switchbacks. I only wish I had done it on a weekday, so as not to have to share the road with so many Ferraris, Maseratis, and many, many motorcyclists, all trying to take the hairpins as fast as possible. 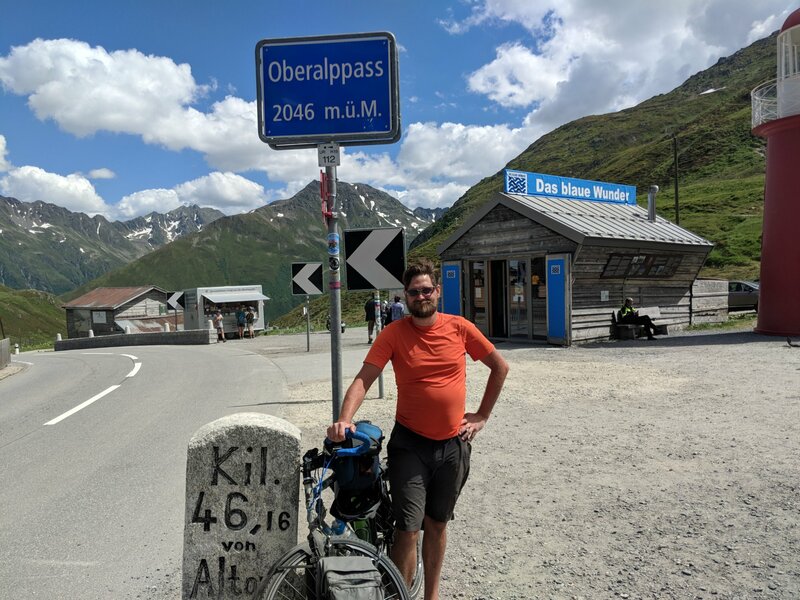 I was pretty wrecked by the time I met Erin at the bottom of the pass – what a ride that descent was – in the tourist ski-town of Andermatt, so we took Sunday off as a rest day. Too bad we forgot that the grocery stores are always closed on Sundays! 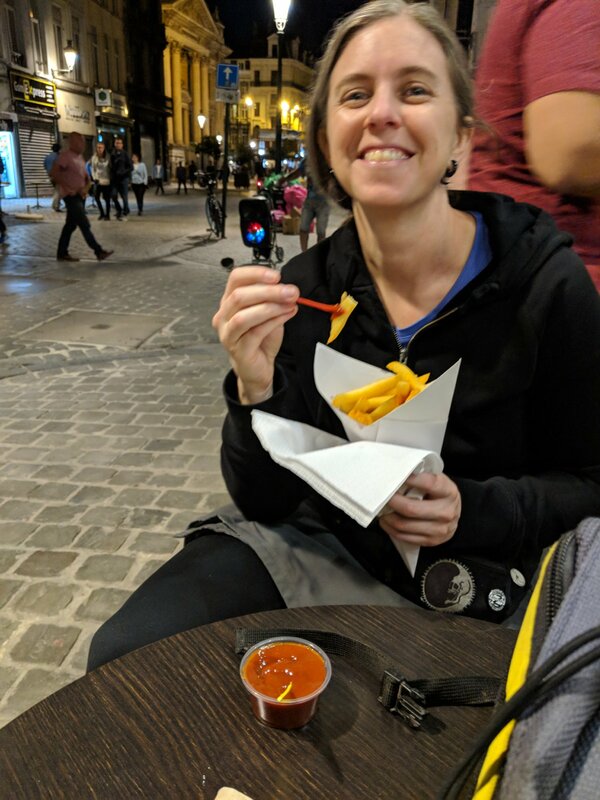 Meals at Swiss restaurants are crazy pricey. 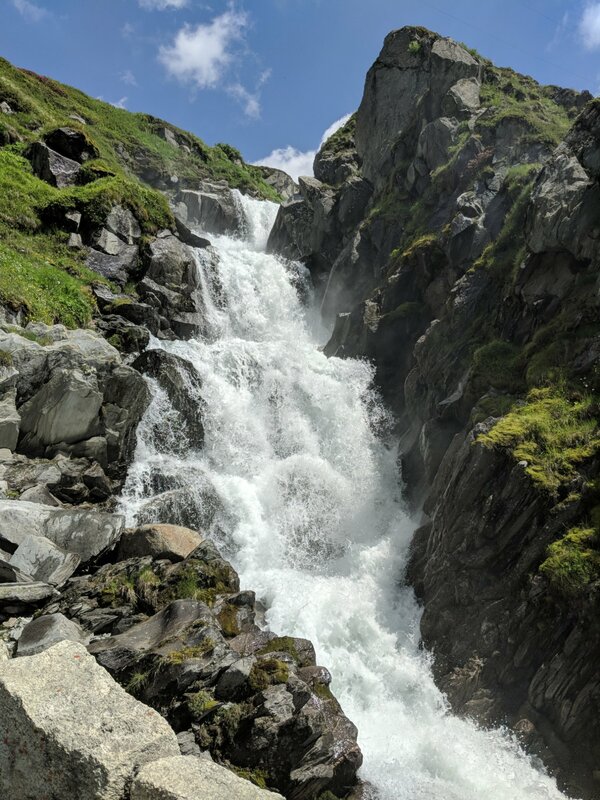 This morning (after resupplying as soon as the market opened) we set off to do our second Alpine pass, the Furka. This was was even more beautiful than the last! 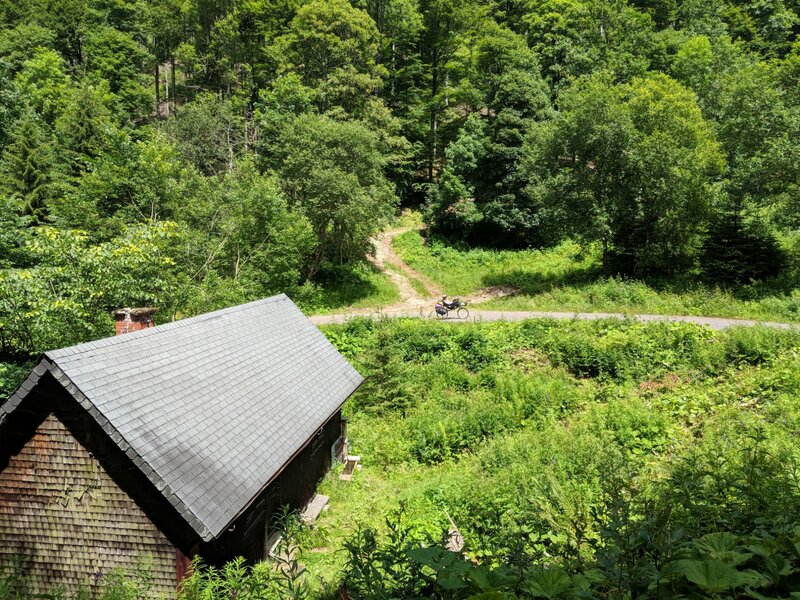 It was also pretty tough – nearly 3000 feet over 7.5 miles, an average grade of 7.2%, but oh, so worth it! 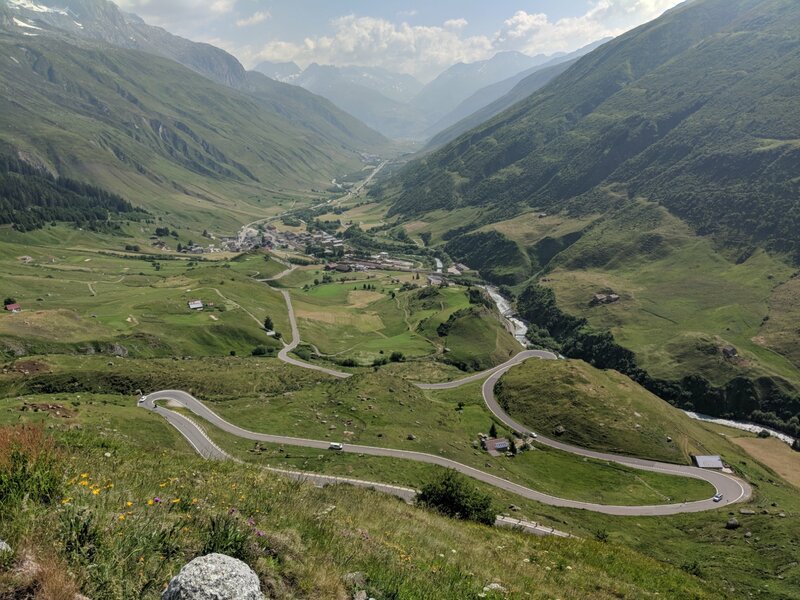 Switchbacks up Furka pass – as seen in Goldfinger! 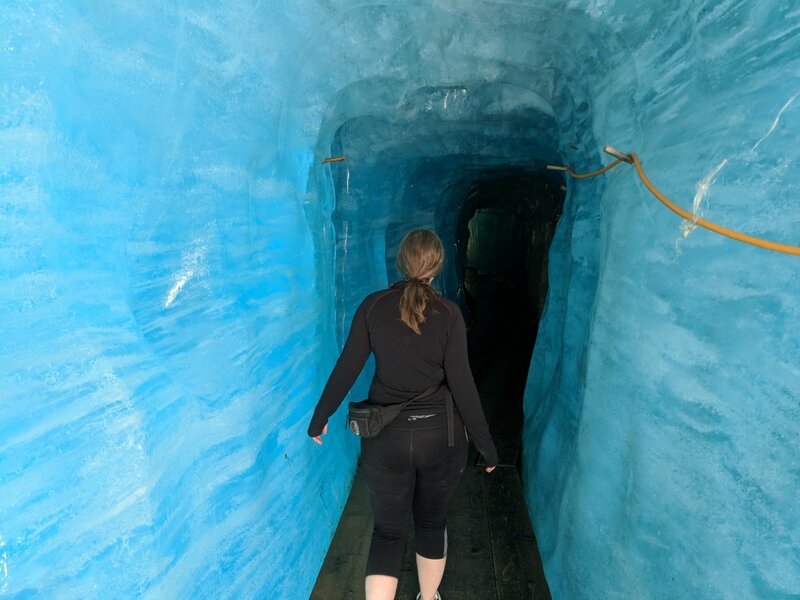 After making it to the top, we started our rocket-ride down towards the newborn Rhone river, but not before making a stop to walk inside a freaking glacier!!! 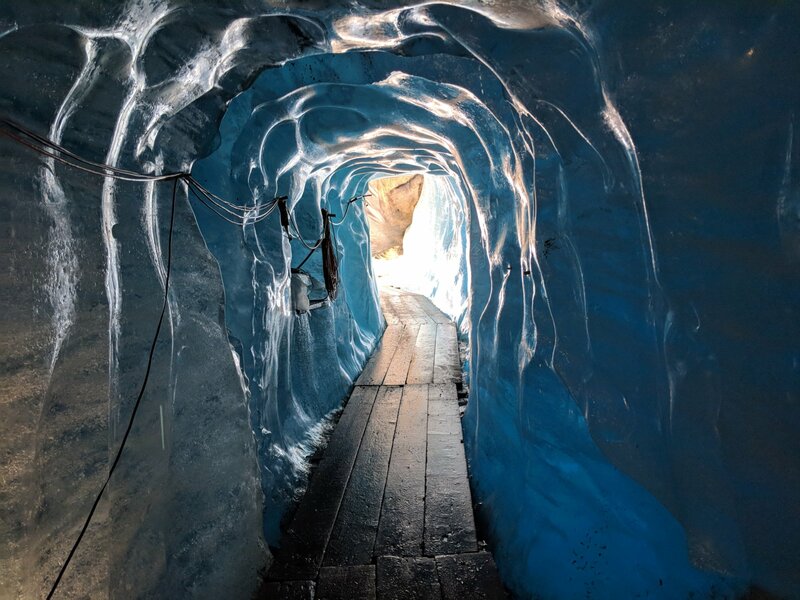 The Rhone is formed out of a glacial lake at the base of the Rhone glacier, and they have cut out an ice grotto you can walk through, preserved by layers of heavy UV resistant fabric. 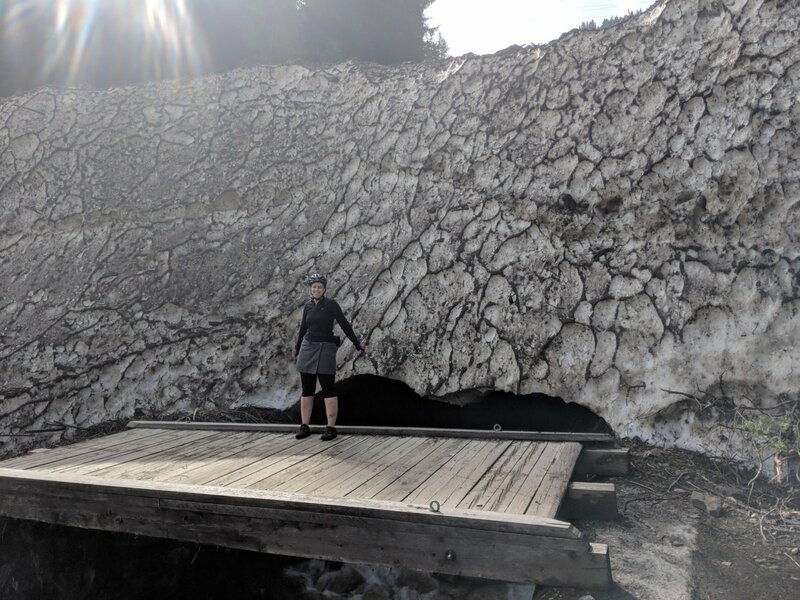 It was truly incredible – you could see little pockets of air that have been trapped in the glacier for hundreds of years. 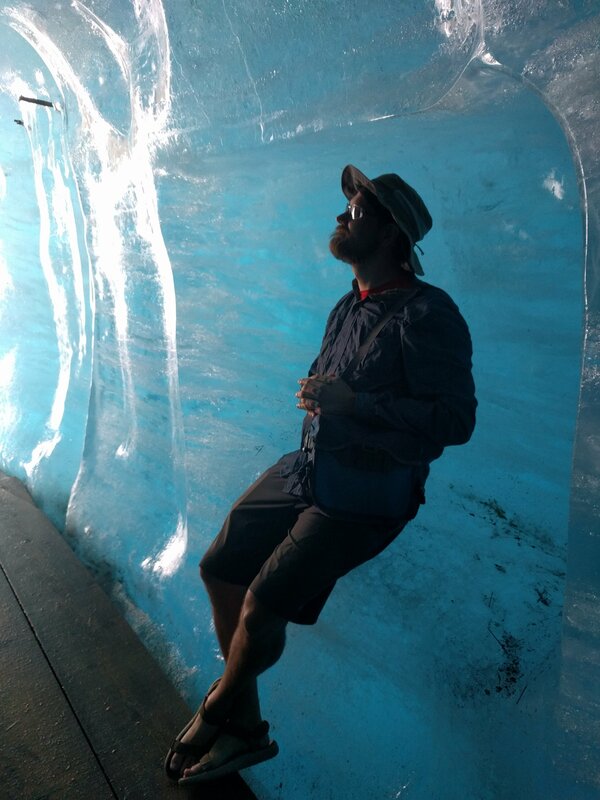 It was a little depressing to read all the signs about how much the glacier had retreated, and that it will pretty much be gone by the end of the century. 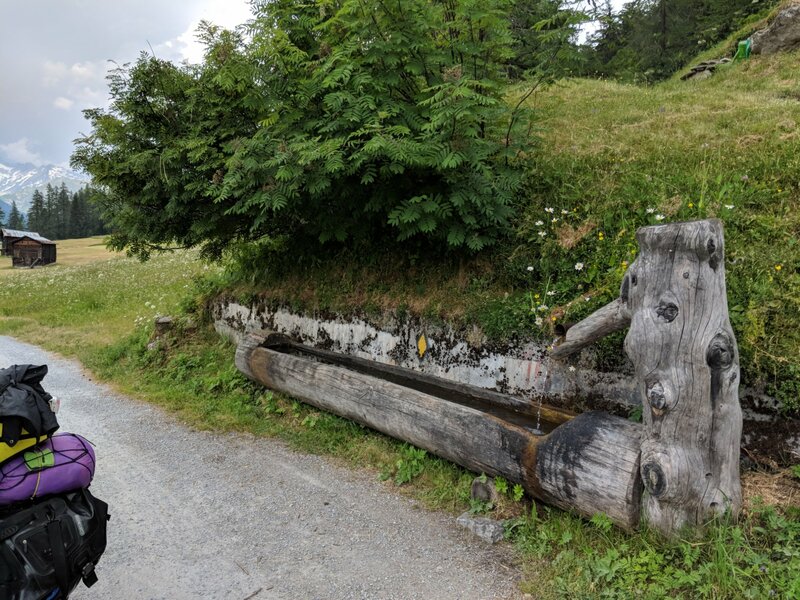 After touring the glacier, we continued our descent, eventually meeting up with the river and following it through more cute little mountain towns. Luckily, we made it to our campsite and set up the tent just before a thunderstorm started dumping hail down on us! What a great couple of days we’ve had! 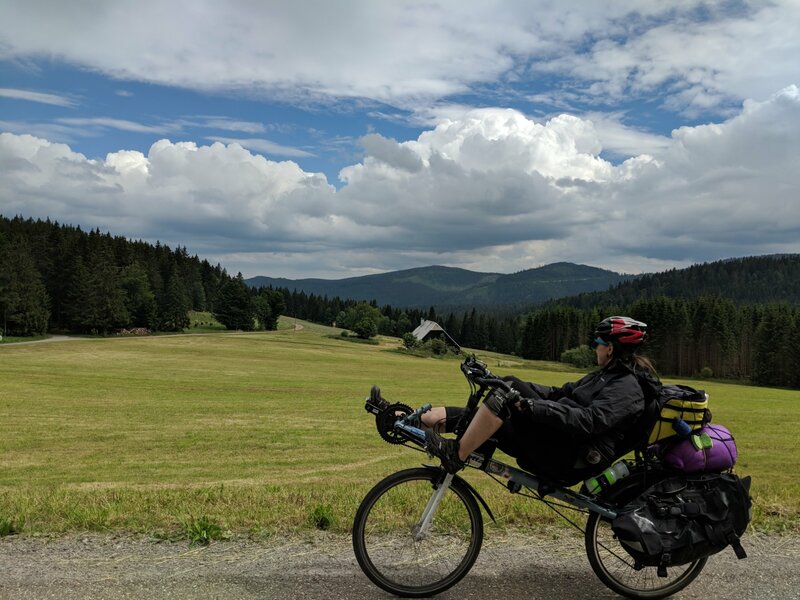 We left the Titisee and, after a steep climb, had an amazing ride down the mountains through the black forest – almost entirely on bike paths! 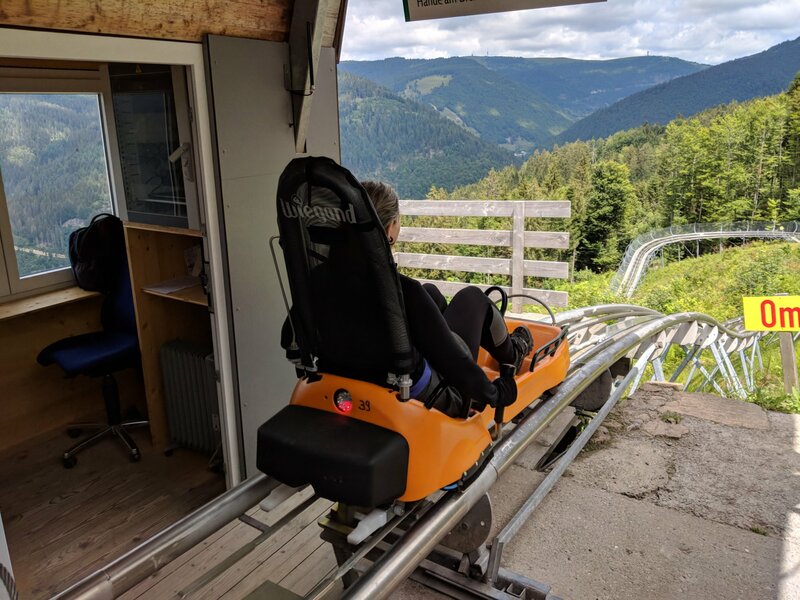 We stopped in Todtnau for lunch, and noticed they had a luge ride down the side of a mountain slope – we weren’t gonna pass that up. All the sleds said Wiegand on the back! 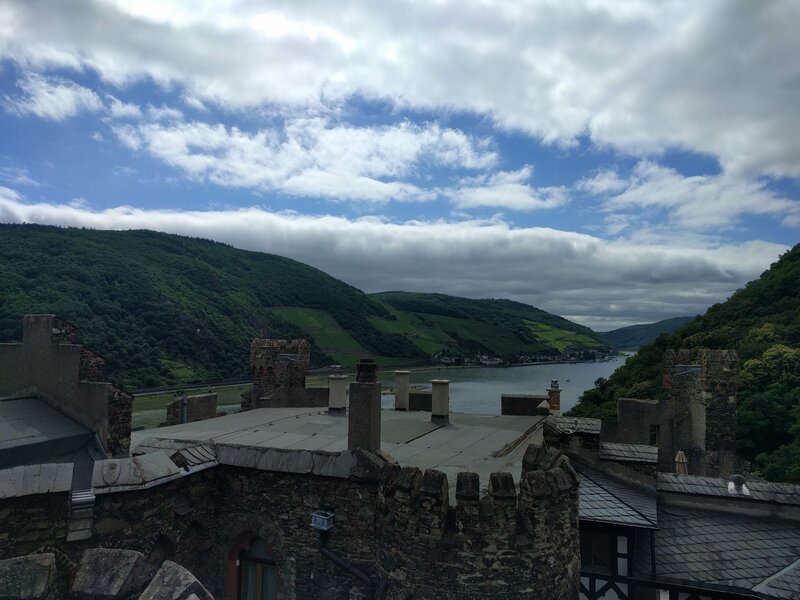 We met back up with the Rhine and kept skipping back and forth between Germany and Switzerland. 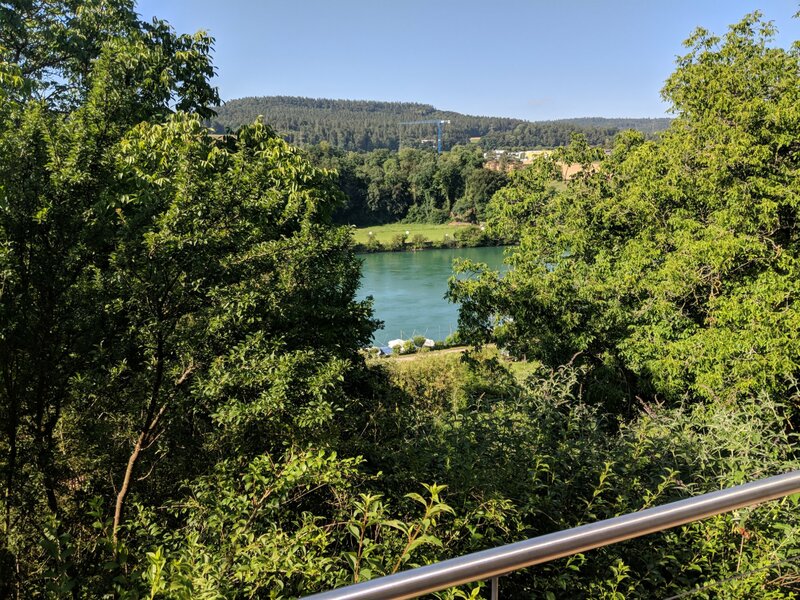 We stayed at a beautiful guest house overlooking the river, with our own private deck. 70 Euro, including breakfast! 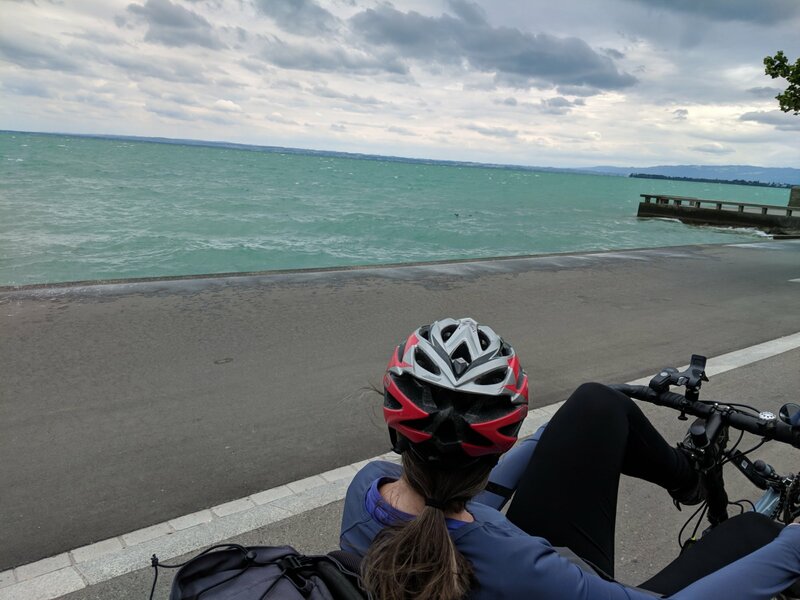 Erin needed a rest day, so we used the Swiss rail system like a warp whistle from Super Mario Bros. 3 to bounce ahead to the next level, which in our case turned out to be Konstanz on the Bodensee (and not a land of water, pipes, or giant turtles). 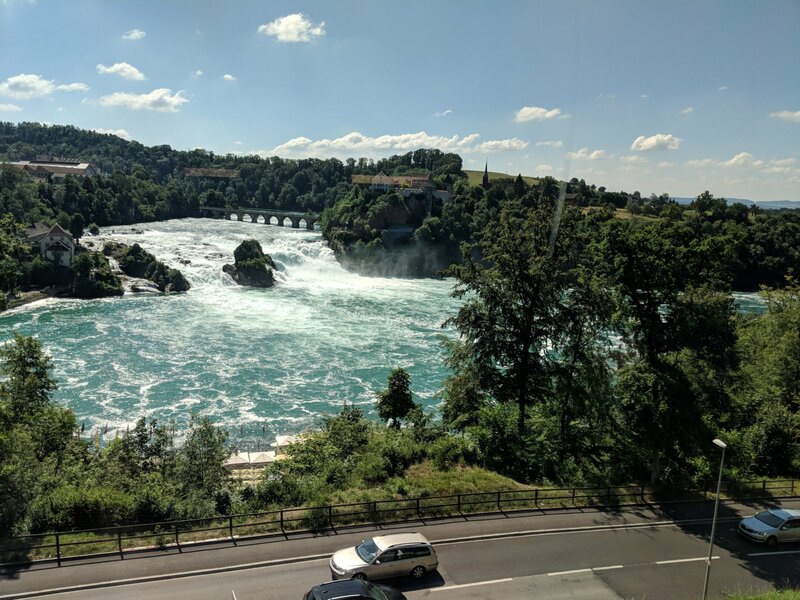 On the way we got to see the biggest waterfall in Europe, the mighty Rheinfalls. 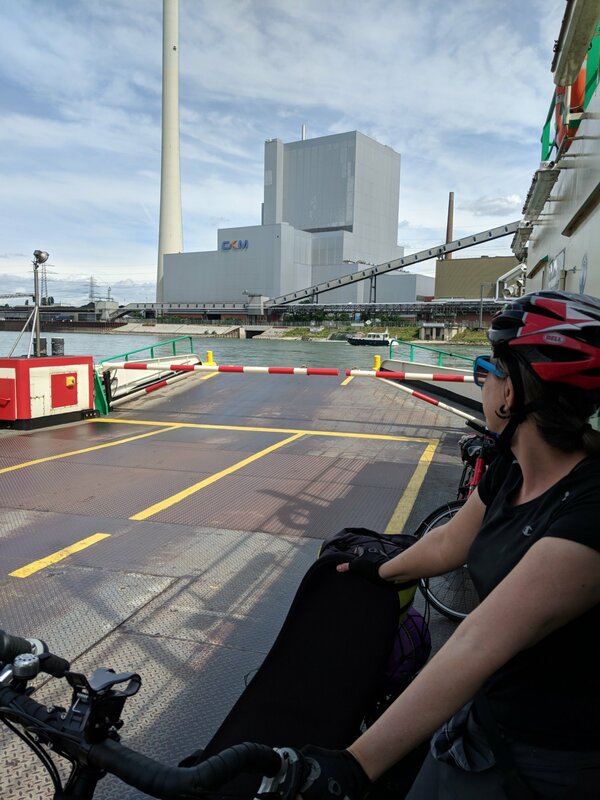 We had a pleasant ride along the Bodensee – I thought it would be like Tahoe, but was a bit more like Erie. 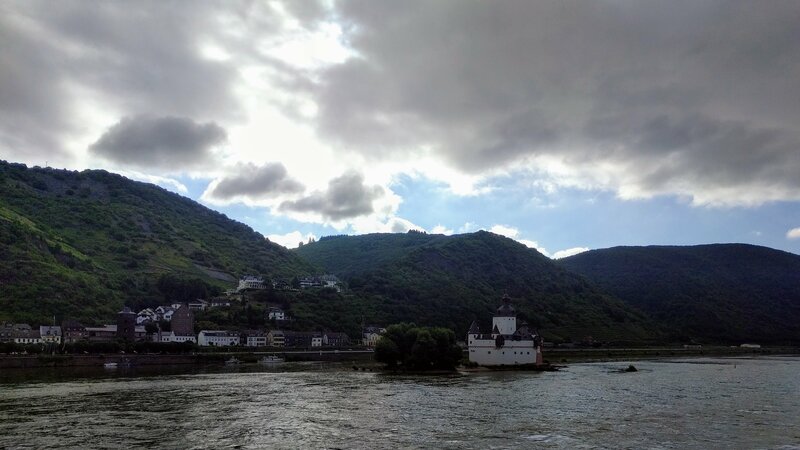 Then, we veered south and followed the Rhine into the Alps! 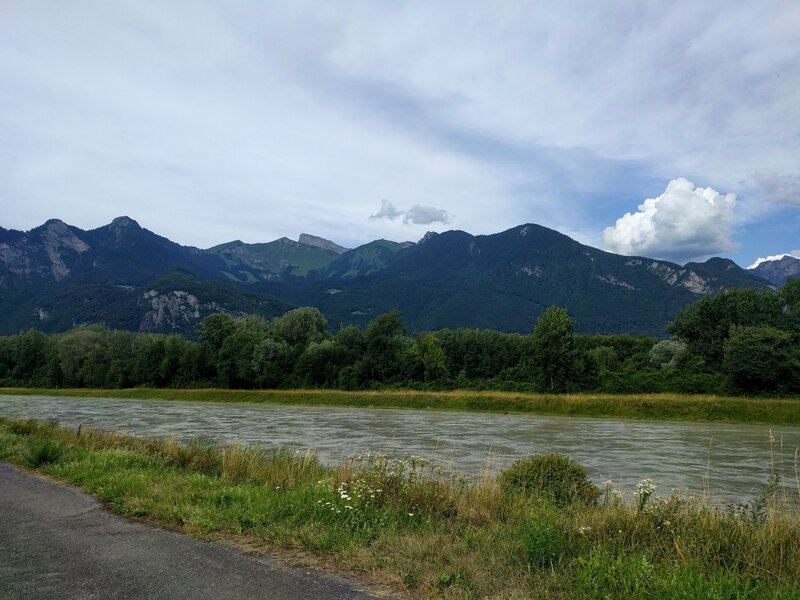 We briefly passed into Austria, and camped in Lichtenstein, bringing the number of countries we’ve ridden through on this trip to seven! 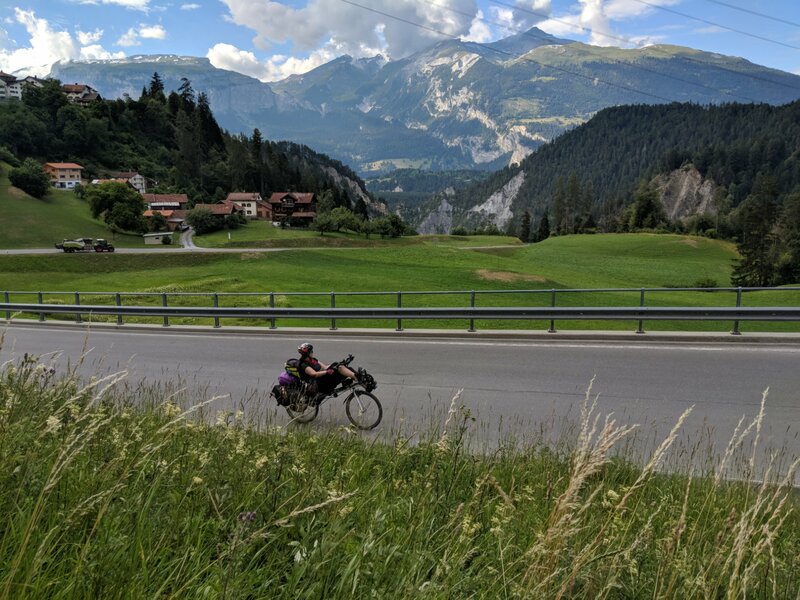 Today had been absolutely stunning as we’ve made our way along smooth bike paths with towering mountains on either side – the Alps are steep! 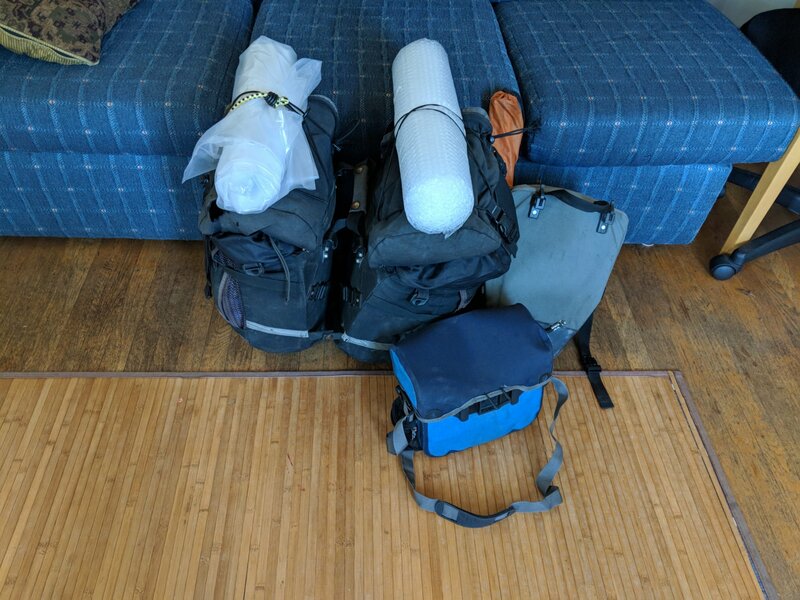 Tomorrow, I’ll going to try to make it over our first pass – it’ll be about 5000 feet of climbing from we are camping, so we’ll see how it goes! 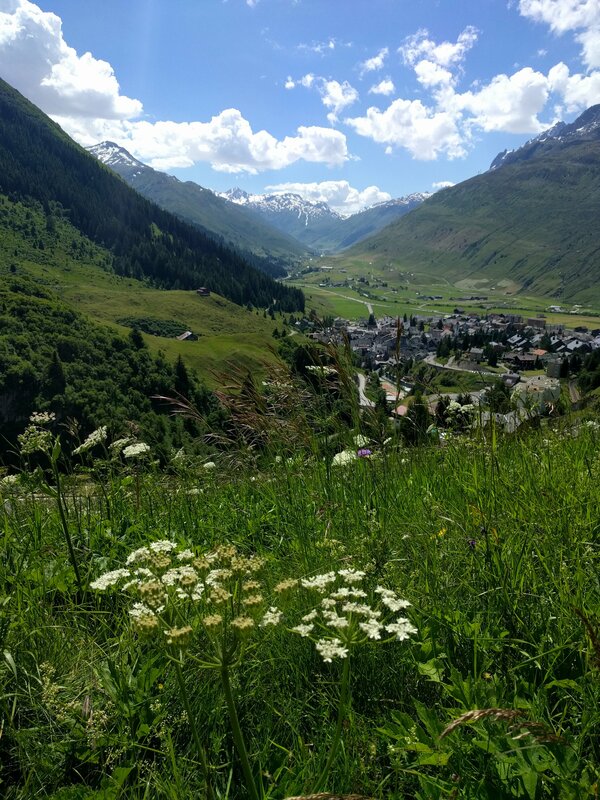 Author gregPosted on June 29, 2018 June 29, 2018 1 Comment on Alps! 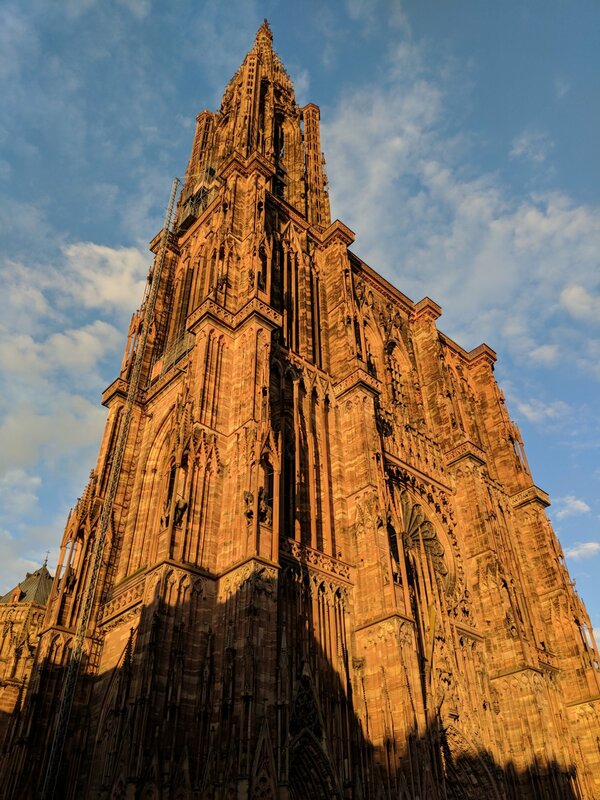 Strasbourg was a much bigger city than I had thought, and we had to get a hotel because the nearby campsites were totally full. Still, the cathedral was pretty impressive! 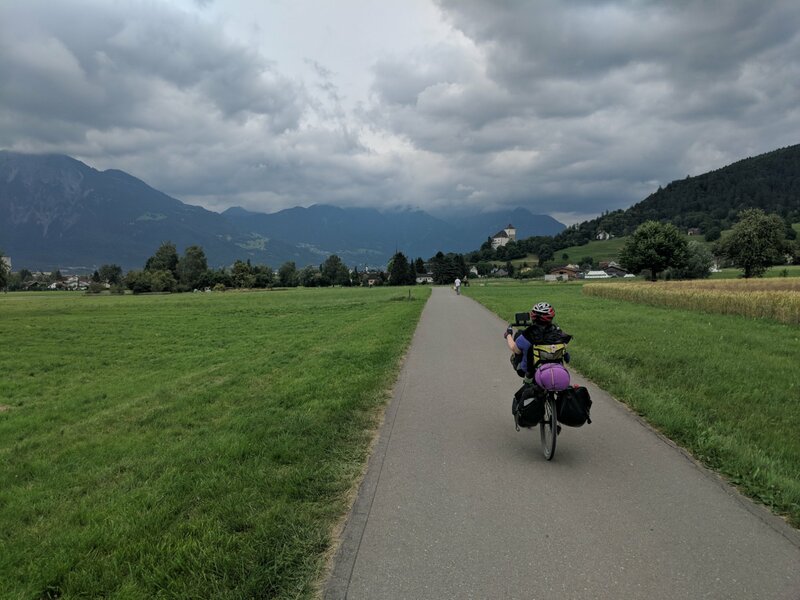 The next day was much nicer: we rode about 20 miles across the border and then got a cheap train day pass to get to Freiburg in the early afternoon. We found a very nice campground just a few minutes away from the city center, and dropped our stuff there before heading back into town. As it happened, it was the day of the Freiburg Pride parade AND the day Germany was playing Sweden in the World Cup, so there were huge crowds everywhere, some wearing rainbow capes and others with black-red-gold face paint. 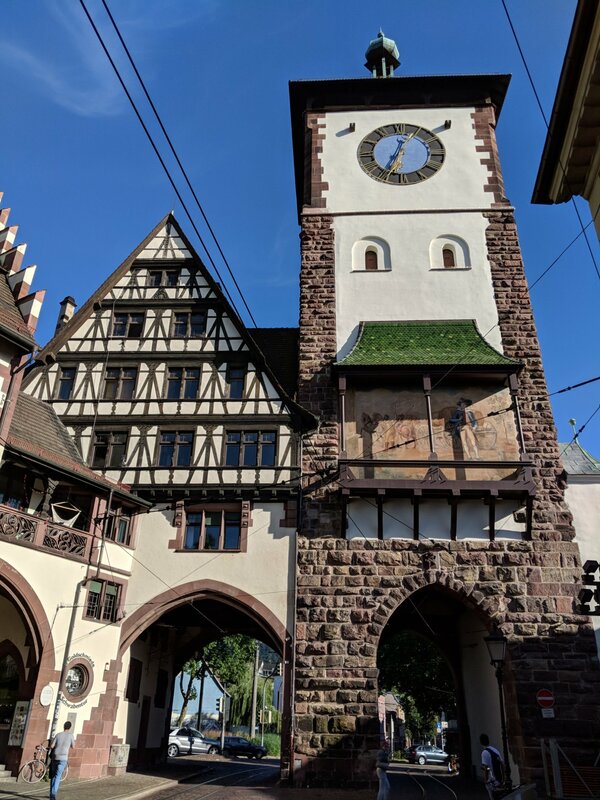 Freiburg is a really cool town, with a stream running everywhere through the old city, cobblestone streets and alleys, and a huge cathedral. 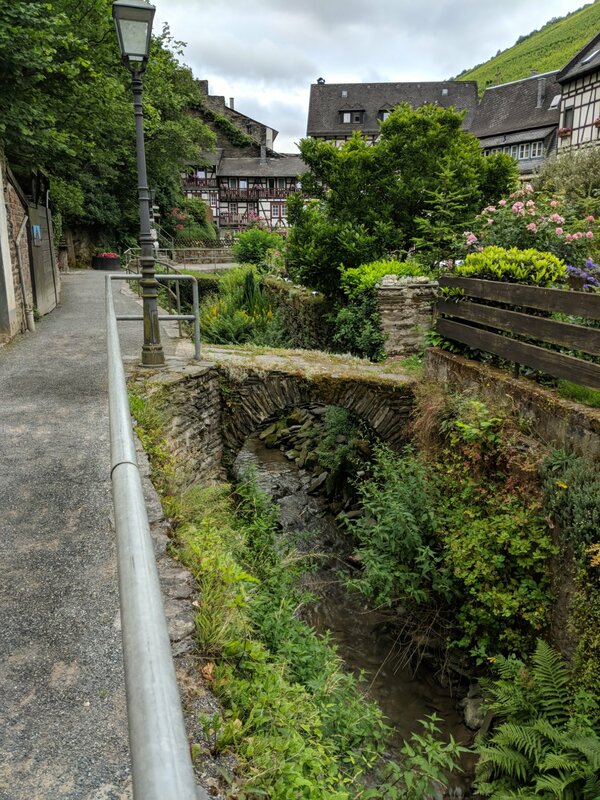 It’s also in a valley in the middle of the Black Forest, so when you look up you see thick forested hills everywhere off in the distance. We ended up in a beer garden to watch the people watching the game, projected on a big screen, and everyone went insane when Germany got a winning goal in the last minute of overtime. Today we had our first tough day of climbing, as we went into the Schwarzwald. 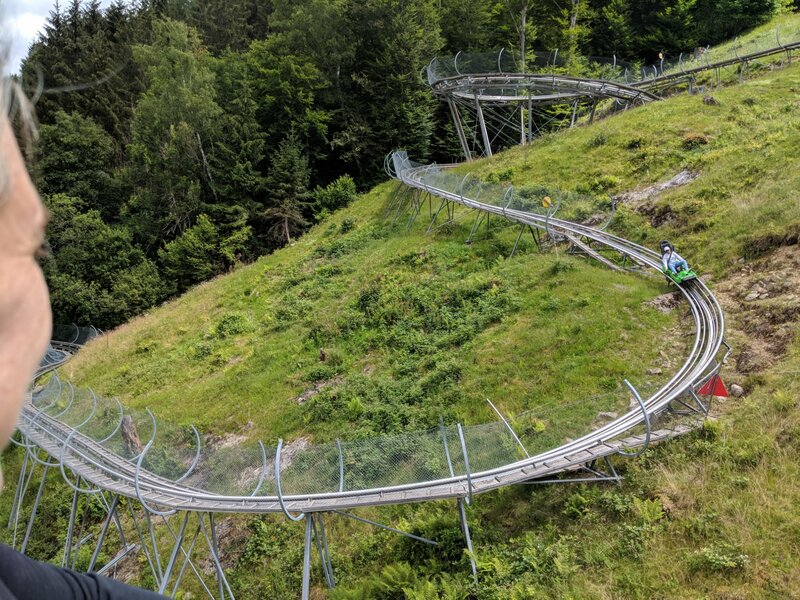 It was a super steep climb for miles, so we didn’t get very far – but we found a great campground on Lake Titisee, with its own little restaurant and even paddleboats to rent. 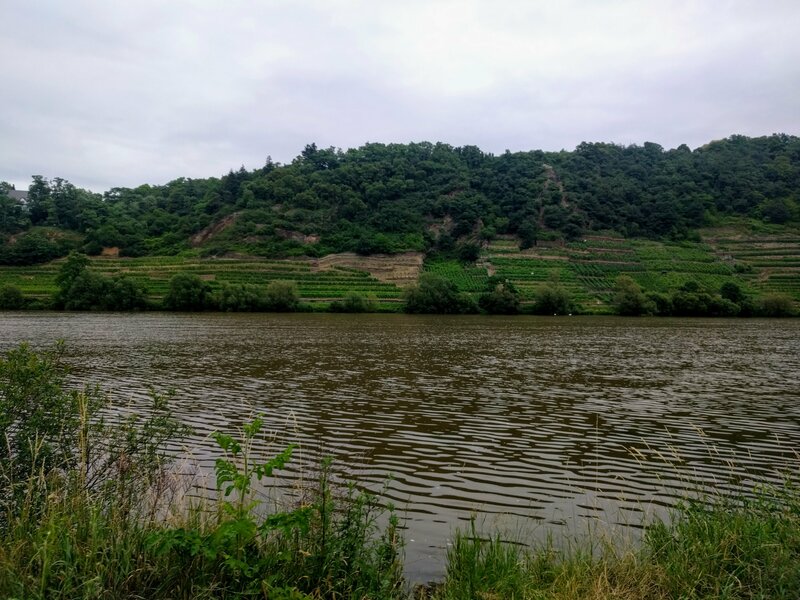 Tomorrow is another hard riding day, and then it’s back to flat cycle paths along the Rhine. All the little bakeries in Germany will make you a tasty cheese and tomato sandwich on a buttered roll for about €2. 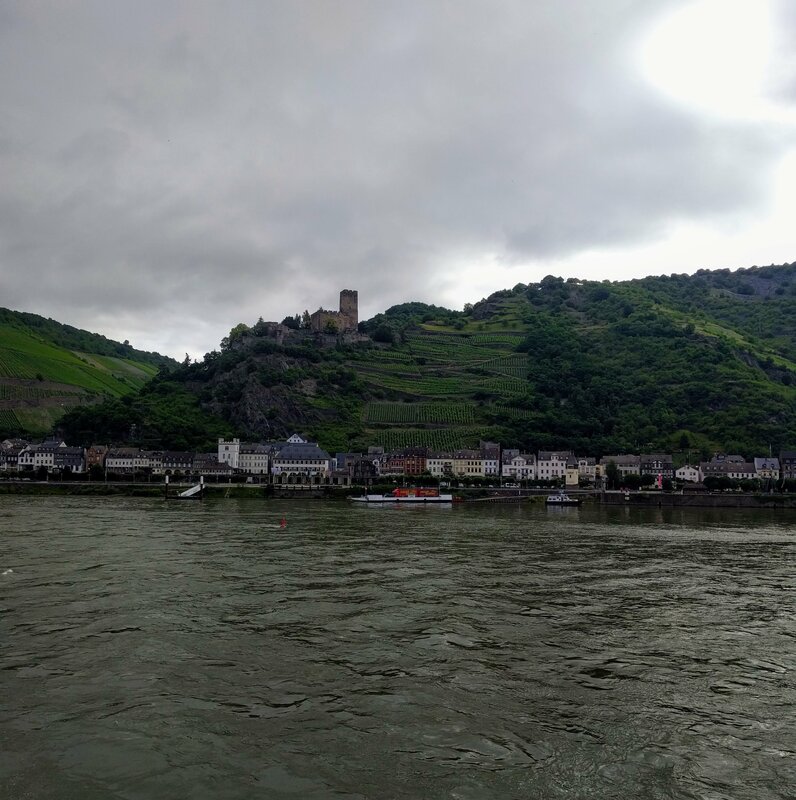 Tomorrow we’ll be riding along the French side of the Rhine before popping back into Germany at Strasbourg. Our first few days of riding have been fairly relaxed, especially because Greg is still pretty jet lagged. 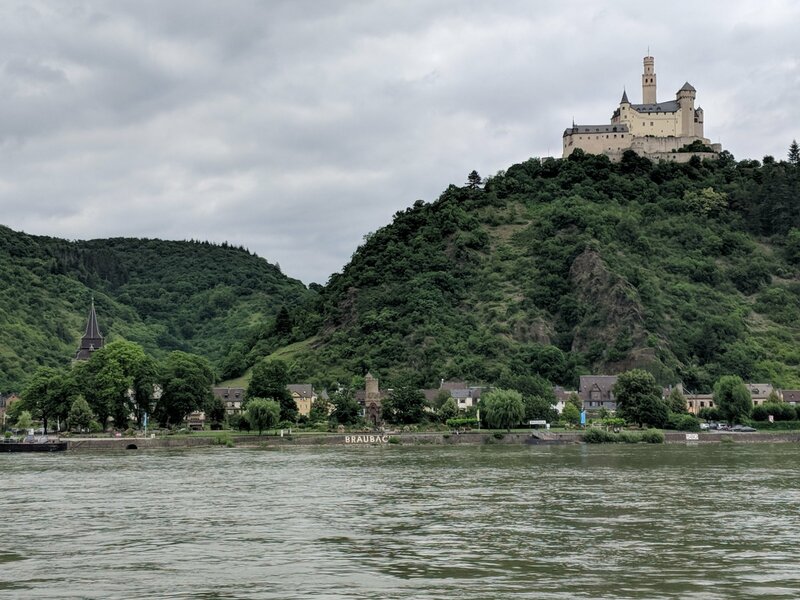 This stretch of the Rhine really is amazing, winding through a valley where you can’t go a kilometer without at least one hilltop castle within view. 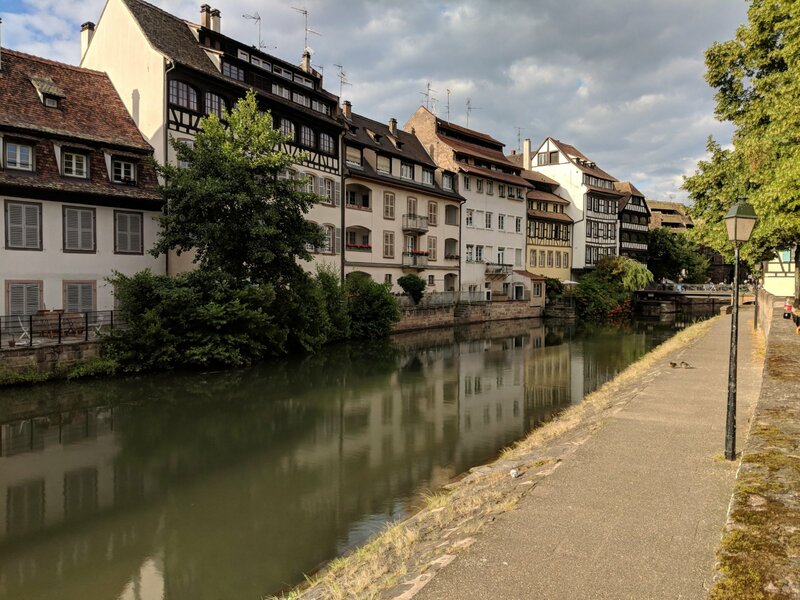 We’re outside of Mannheim right now, still debating whether or not to adjust our route to go to Strasbourg. Guess we’ll see where we end up tomorrow! 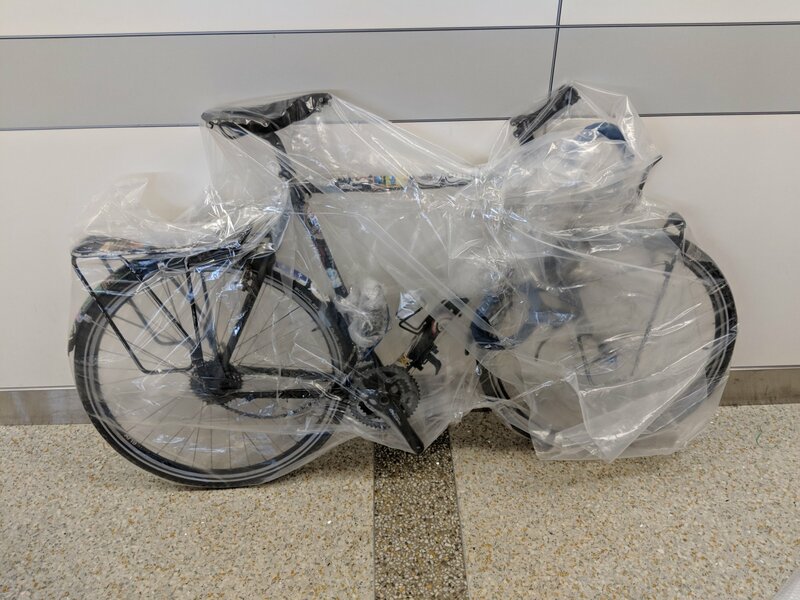 I was a little trepidatious about my plan to forego the bike box and just put my bike on the plane in a large plastic bag – because my bike is so large, it’s hard to find a box but enough\n for it, plus it usually takes at least an hour to disassemble/reassemble it. With the bag method, I could just ride my bike to the airport, pop off the pedals and handlebars, and I was good to go! Thankfully, the bike arrived unscathed. 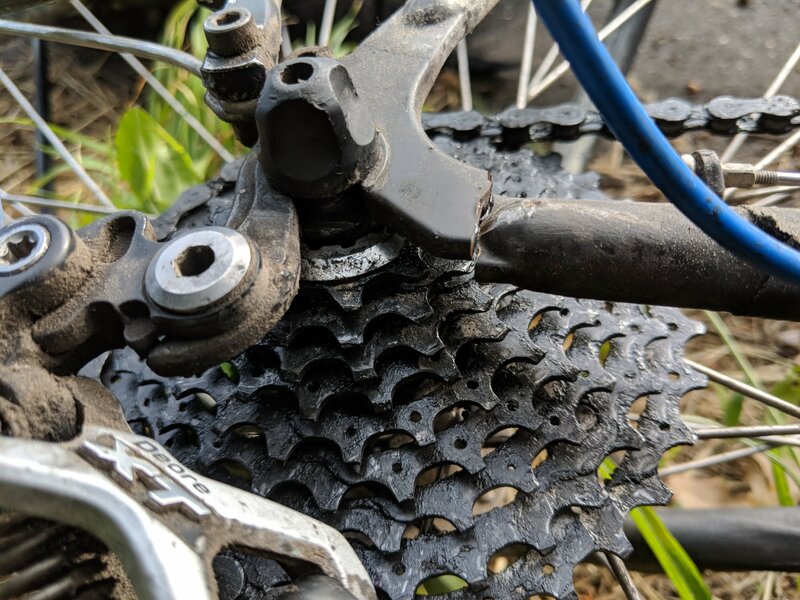 The only issue was that I had removed my rear derailleur in order to protect it, and somehow knotted up my chain while putting it back on. This resulted in me sitting on a train with bike grease up to my elbows trying to figure out how my cable ended up routed through my chain. But I made the connection with Erin without issues, even though my flight was an hour late, and the train from the airport was twenty minutes late. Thanks for the tour, Tammy and Joe! It’s Monday morning and we’re almost ready to get rolling. 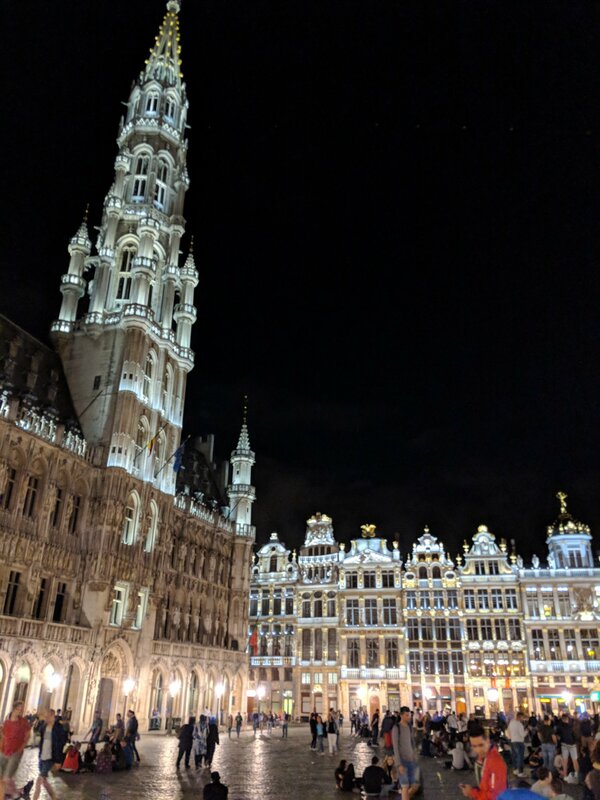 Saturday Greg and I got to Brussels right on schedule, but our bikes missed their train and had to come on a later one. 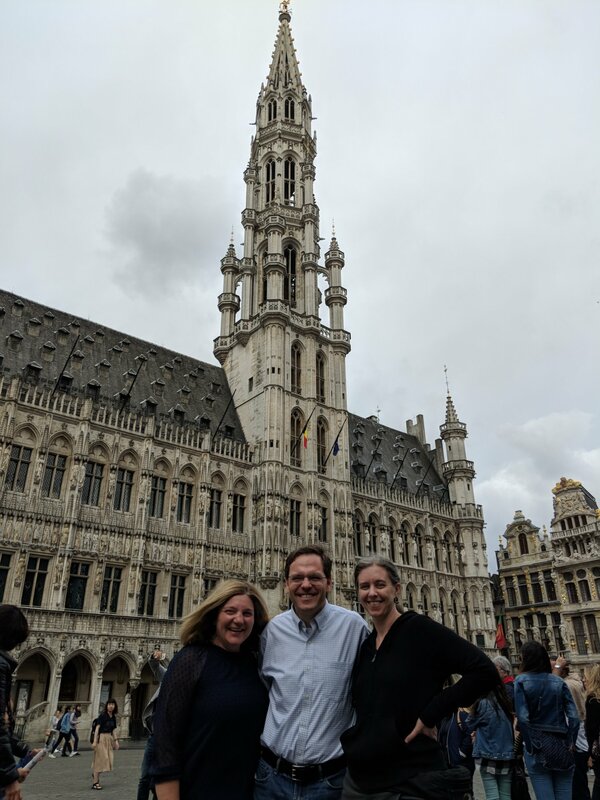 Yesterday we met up with Greg’s cousin Joe and his wife Tammy, who live in Brussels. They took us out for breakfast and showed us around town for a while before we had to catch the first of a series of trains to Germany. 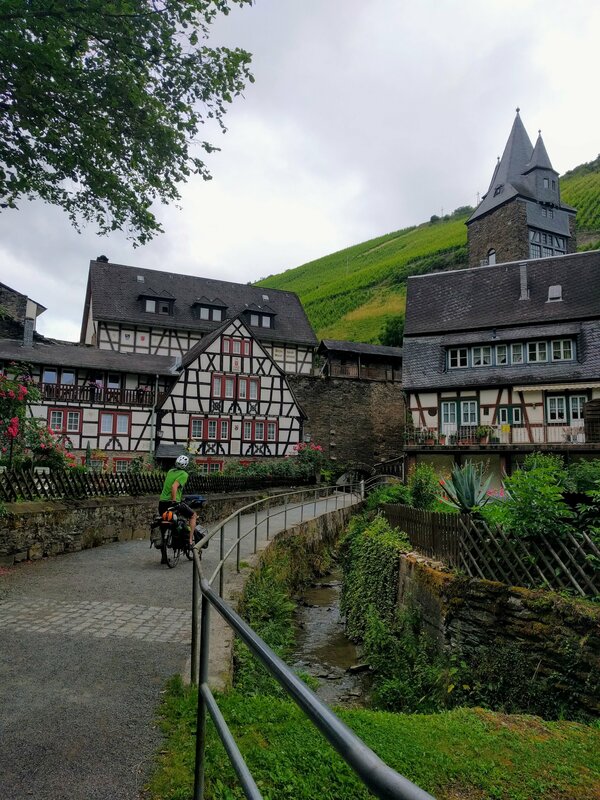 On one exciting train transfer Greg got yelled at in German for almost touching another cyclist’s (presumably expensive) bike.Koblenz is beautiful, and we had a great night at a campsite on the Mosel River. 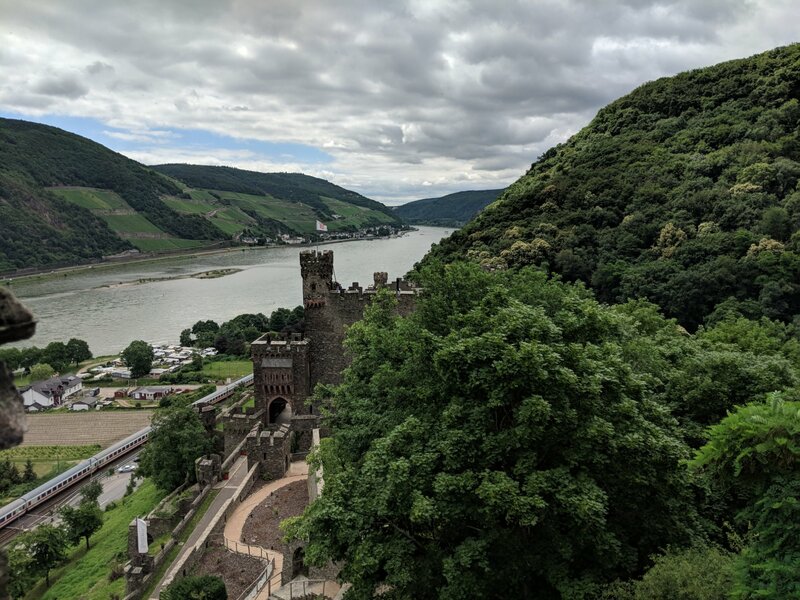 We found a cute cafe that does a vegan cheese-and-deli-slices breakfast, and then we’re heading out along the Rhine for the rest of the day. Los geht’s! 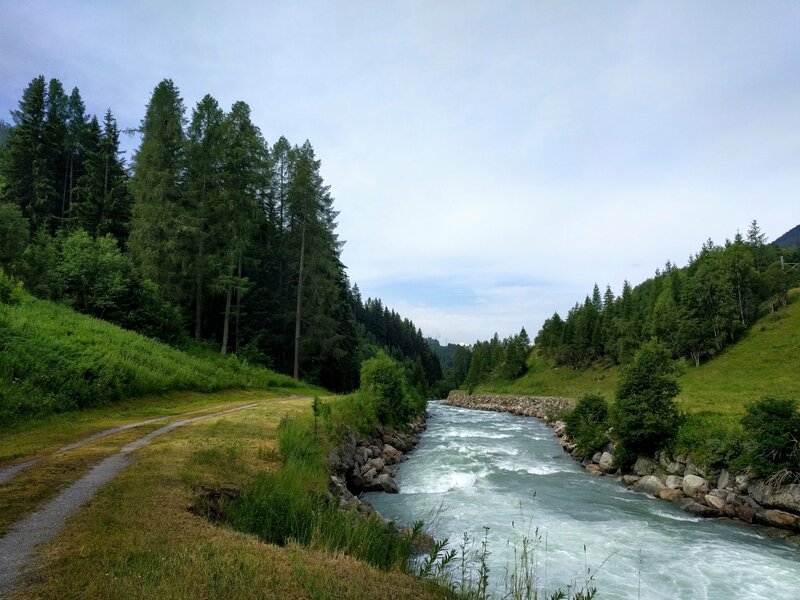 Author erinPosted on June 18, 2018 Leave a comment on Kette rechts! This time, the adventure is starting even before I’ve left! During my final tuneup, I noticed a dent in my rim. The trusty folks at lucky duck bike shop suggested I should probably get my wheel rebuilt with a new rim. Unfortunately, they got the wrong rim shipped to them. They should have the correct rim by now, but hearing “what’s the latest cutoff time to make your flight” is a bit nerve-racking. Now I’m four hours away from when I need to be at the airport, with no rear wheel on my bike! But, old wheel or new, I’m getting on that plane! 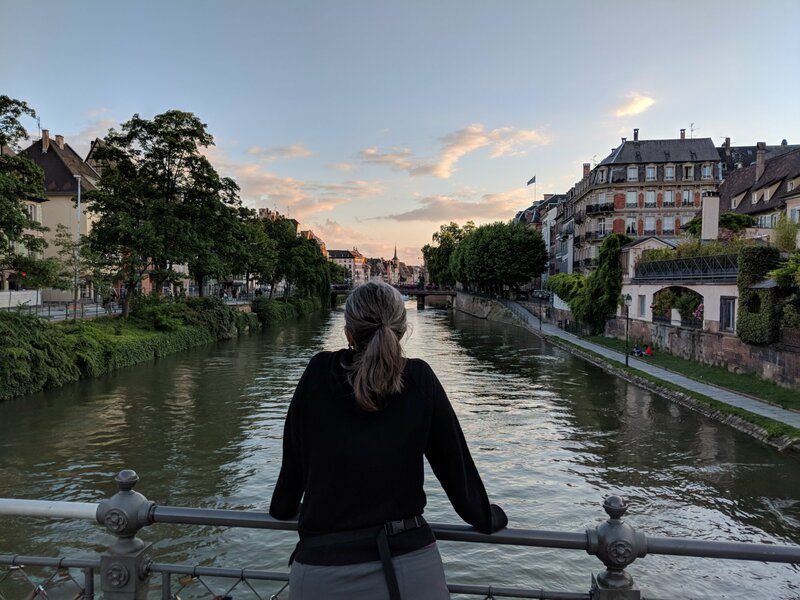 Author gregPosted on June 15, 2018 June 15, 2018 Leave a comment on Another adventure begins!